This is a pic of a lap throw that was made for my son by his great grand mother. She did this for all the great grand kids one Christmas manyyyyyy moons ago. 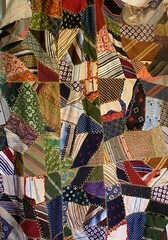 It was made with quite a variety of men's ties and some ummm....interesting polyester from blouses and dresses. (I presume anyway.) As can be seen there is a considerable amount of damage to it, inclusive of the feather stitch embroidery done on all of the seams. I got a wild hair just after Thanksgiving and decided that it was time to get some projects (mmmmhmmmm) completed and dove head first into re-storing this quilt. There was more damage to it than met the eye. Like mildew damage to the foundation!!! Awckkkk!!! Sooo... I took some light weight flannel that I had and put it on the back. Keep in mind that i'm not a "planner" by nature and was flying by the seat of my pants on this one! I used the flannel as added support. Hind sight....should have traced the pattern of the original, taken apart the blocks and re-pieced it. Then...I could have made it straight, but then it wouldn't be an accurate reflection of the maker and the love she poured into this project. I then took out every piece of fabric that was damaged and re-placed it with pieces of ties that I have on hand. The embroidery overall was disintegrating, so I decided to take it out completely and re-do it pearl cotton in a similar color with hopes that it will hold up better under use. I wasn't worried about the monetary value of this piece, more about it's sentimental value to my son. I also wanted it to hold up for another 26 years without need of repair! LOL!!! It was with a HUGE feeling of relief and pride in the completion of this that after 80 hours, I can say I am done!!! I re-backed it, tied the edges, wrapped it up and fooled my son by saying it was from his great-grandma! :_) Oh! And the difference on this quilt....besides the fabric....and admittedly a bit of the stitching....I put a quilt label firmly on the back, documenting the date it was originally made, then re-stored and what was done! No one will ever wonder about this puppy again!! Now to get a pic of the "new" version so you can see the changes. I did quite a bit of reflecting while I worked on this and wonder how on earth a piece can be accurately restored with fabric from the period? The very thing that causes it to deteriorate would cause other "like" fabric to disintegrate too, wouldn't it? Hmmmm....something to explore! Enjoy! I belong to the Hand Embroidery yahoo group and there is a heart swap going on there right now. soooo, I thought i'd jump in and join the fun. I don't normally work in purples, but had it out as I was making a block for the Art Bra Ladies quilt. I then did some stich variations on the seams and utilized the butterfly lazy daisy that Sharon B of In a Minute Ago shared with us in her first class last spring. On the top heart, I had a MOP button that I thought would look good, but didn't have holes or a complete shank. It was a part of some vintage buttons I purchased awhile back. Anywhoo, I created a web over the button to hold it down and added some lazy daisies and french knots along with the litle butterfly. I tried to keep a more garden effect with doing a buttonhole stitch, adding fly stitches on top and the some french knots for flowers. It was stretch to work with these colors, but I like how they came out, especially the bottom heart! Can't wait to see what comes back my direction for the swap! I don't post forever and here I am posting a ton of stuff all at once! Sighhh..... I wish I could learn to post more regularly. New Year's resolution, right? Welllllll????? LOL!! 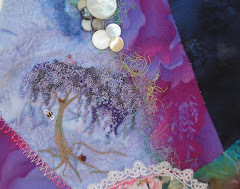 This is a block I worked on for Hideko who keeps a blog... http://hideko-windfromtheeast.blogspot.com. 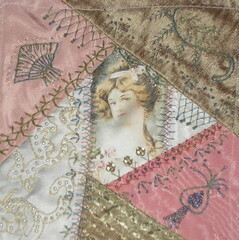 This is a luscious block of silks, velvets and some metallic brocade fabric. I was stumped by what to do at first, but finally got in the swing of it. I decided to create a monogram in the lower left hand corner. 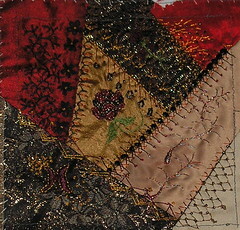 A beaded rose is in the center, some feathers and some of my seam treatment variations. Gonna have to definately start challenging myself on my stitches! But then....that's what Sharon's "Take a Stitch" Tuesday will be all about, right? http://inaminuteago.com/blog/index.php?tag=take-a-stitch-tuesday I will be participating in this with some members in a small group I belong to. We thought it would be a great way to nudge each other along and develop or stitching repertoire! Should be fun! Now....just got to remember to post about it! Enjoy the pics! I jumped into another DYB rr and this is the first block for this one! I decided to keep it light and more victorian to compliment the young girl. I, in fact, rather envisioned her looking out of a window so I gave her "lace curtains" done in the fly stitch. I outlined the pattern that was on the satin and gave it a small boost with some pearl beads and added the seam treatment variations that I seem to naturally drop into these days.... herringbone, lazy daisy and cretan. I really like the way they make things look victorian. Up top I added a feather with an outline stitch and feather stich then two fans on either side of the block. Soooo.....another block done! Yeahhhh!!! !